When information is needed, Skip Tracers will leverage their contacts and find it. Relentlessly, these Bounty Hunters let nothing stand between them and completion of their contract. 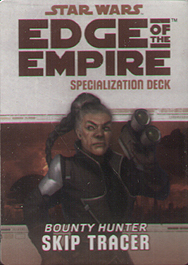 This deck requires the Edge of the Empire Core Rulebook and No Disintegrations. It includes cards for all 20 talents available in the Skip Tracer specialization.